Microfilm is very sturdy and can last 100 years or more. It provides a very clear representation of the mantra (when viewed by a microscope) and also allows for the mantra to be wound inside the prayer wheel following the lineage instructions of Nagarjuna. The Mani mantra was reduced extremely small so that millions and even billions of the mantra can be placed inside each prayer wheel. We combine traditional Buddhist specifications with modern technology to make prayer wheels that will provide the most benefit to all beings. 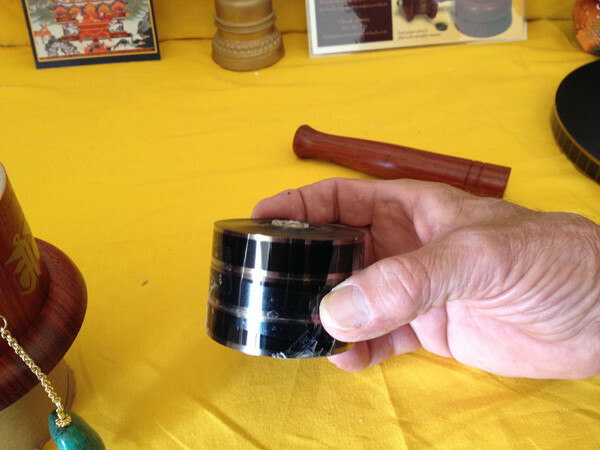 ​Chuck begins by creating a cylinder that will hold the microfilm, applying an outer wood veneer to the cylinder and adding the outer gold letters* and place for jewels and counterweight for handheld prayer wheels. *The gold letters on the outside of the prayer wheel are written in the Lantsa script. This is an ancient letterform of Sanskrit that was preserved in Tibet. It is mainly used in temple decoration above doors and on beams. Lama Zopa Rinpoche has advised that this letter form is very beneficial to use on prayer wheels. Now he is ready to reel the microfilm that will go inside the prayer wheel. He cuts a copper rod to the correct length, adds the life tree mantras, and reels the mantra to the appropriate diameter for the prayer wheel. ​For handheld prayer wheels, Chuck adds the counterweight, which can either be a turquoise or coral stone. ​Then he adds the earth and sky mandalas. ​Then he places the microfilm roll inside the prayer wheel. ​Prayer wheels have between two to seven stacks of microfilm depending on the prayer wheel's size. Finally Chuck finishes the prayer wheel by putting the wood pieces together, adding the top crystal, and other jewels. 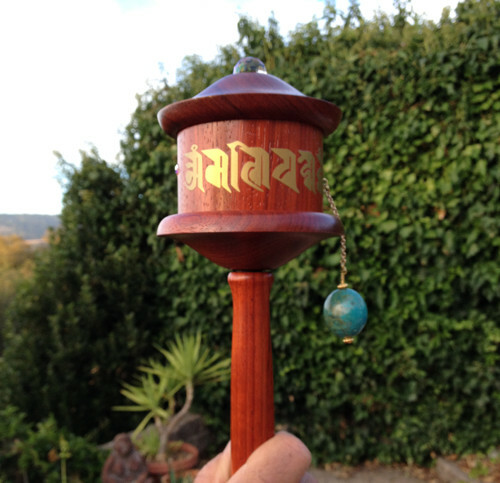 ​A finished handheld prayer wheel with turquoise counterweight ready to spin into action. Visit Benefits of Prayer Wheels and Prayer Wheel Practice to learn more about the benefits of prayer wheels and a practice you might do as you turn your prayer wheel. 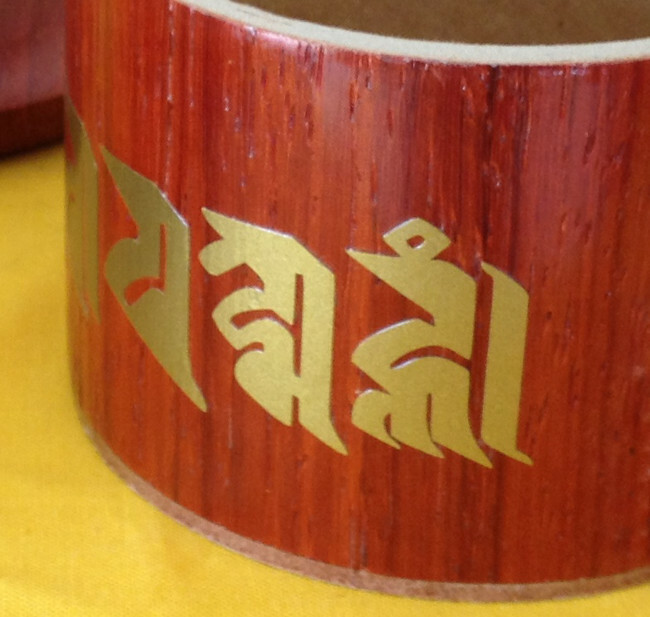 If you are interested in ordering a prayer wheel, please visit our Inquiry Form.